The Asia-Pacific MICE industry generated revenue of $229.0 billion in 2017, and is expected to grow at a CAGR of 8.6% to reach $441.1 billion by 2025. The term MICE in the context of travel is an acronym for meetings, incentives, conferences, and exhibitions. It represents tourism that includes business events and activities. 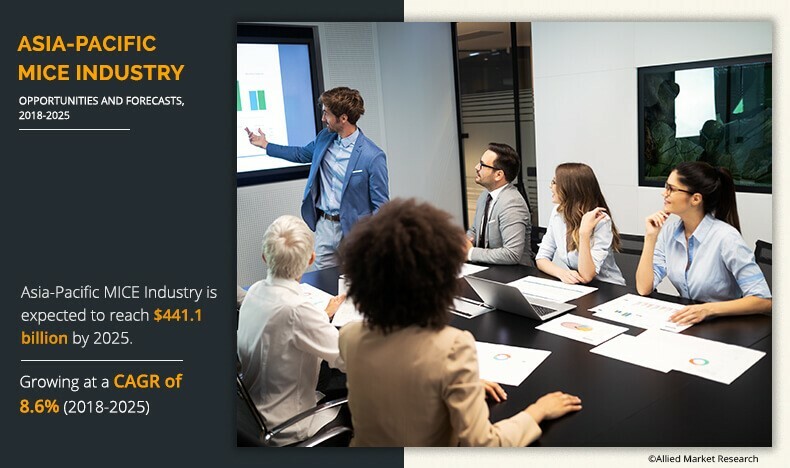 The attendees of MICE are basically business travelers engaged in business activities such as client meetings, brand promotions, employee training activities, & others. These business travelers are connected to different sectors of the tourism and hospitality industry through their MICE activities. Substantial development of the travel & tourism sector has fueled the demand for MICE industry. Asia-Pacific MICE industry is segmented based on event type and country. Based on event type, the market is classified into meetings, incentives, conventions, and exhibitions. 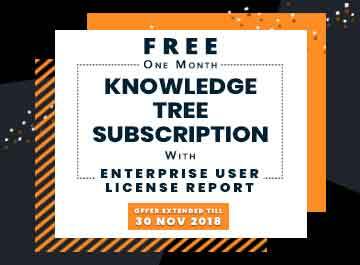 By country, it is analyzed across China, India, Singapore, Thailand, Indonesia, Australia, New Zealand, Japan, Malaysia, South Korea, Vietnam, Hong Kong, and rest of Asia-Pacific. 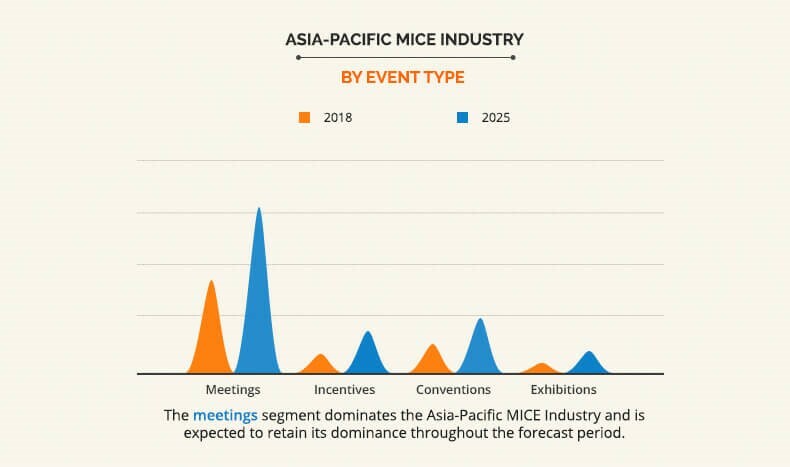 In 2018, the meetings segment dominated the Asia-Pacific MICE industry accounting for $159.4 billion, and is expected to grow at a notable CAGR of 8.5% during the forecast period. This is attributed to positive economic trends, improvement in the infrastructure, and enhanced tourism combined with global expansion of Asian companies. Recent trends of organizing hybrid meetings and use of social media and meeting apps are also expected to boost market growth in the near future. The leading players in the FMCG market focus on providing customized solution to consumers as their key strategies to gain a significant share in the market. The key players profiled in the report include Questex, LLC, CWT Meetings & Events, IBTM Events, BCD Meetings and Events, Capital Travel and Events, CiEvents, Conference Care Ltd., The Freeman Company, ATPI Ltd., and Interpublic Group of Companies, Inc. 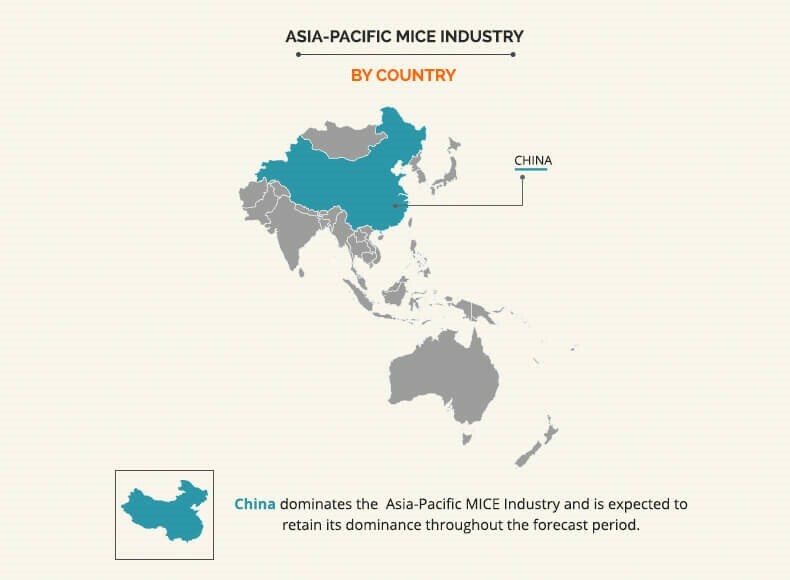 This report provides a quantitative analysis of the current trends, estimations, and dynamics of the Asia-Pacific MICE industry from 2018 to 2025 to identify the prevailing market opportunities. Major countries in Asia-Pacific MICE industry are mapped according to their revenue contribution to the industry. Market player positioning segment facilitates benchmarking and provides a clear understanding of the present position of market players. The report includes the analysis of the key players, market segments, application areas, and growth strategies. 6.9. INTERPUBLIC GROUP OF COMPANIES, INC.
Asia-Pacific is one of the fastest developing regions in the world, and thus, strong economic growth is one of the major factors that boosts the growth of the MICE industry in this region. Despite slow growth of the Chinese economy, countries such as Singapore, Thailand, Japan, and India, have experienced demand from buyers at record levels in recent years and offer lucrative business opportunities for investors. Rapid growth in the business travel sector in recent decades has positioned Asia-Pacific as the largest market in the world. However, owing to lack of well-developed infrastructure in the region , the prime focus of the governments is on infrastructural development, such as roads, airports, and others, to cater to the emerging demands for the travel industry. Ease of visa restrictions, investments in better infrastructure, and high demand in commercial aviation from Asia-Pacific are some of the other factors that fuel the growth of the Asia-Pacific MICE industry. In addition, high penetration of internet & technology in the densely populated countries supports the growth of the market. Therefore, developments in MICE industry majorly drive the economic growth, regional cooperation, and intellectual development in the region. "Asia-Pacific MICE industry by Event Type "